The holidays have always been my favorite time of year. Gatsby and I love celebrating Thanksgiving with our family, decorating our home with holiday cheer and spending time with our special friends. We are extra excited this year to share our holiday traditions with our newest family member Daisy. 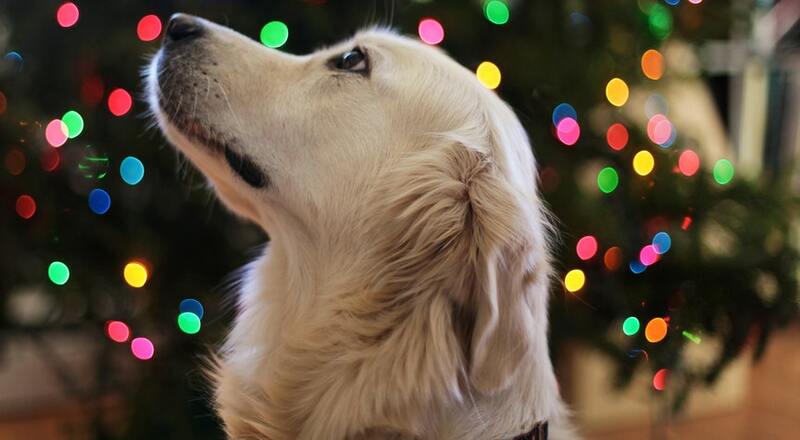 Here are twelve holiday traditions that you can share with your doggy and fellow doggy mommas throughout the season. Be sure to include your furry family members in your holiday card. Whether by mail or email, your friends and family will love seeing your smiling doggy in your holiday photo. The holidays are the perfect time to give back to the community and to those less fortunate. We all live in cities and towns with local animal shelters. Donate food, leashes, toys or your time. Contact your local shelter to find out what is most needed this season. Get a group of mommas and their doggies together for a “cookie” exchange. Bake a dog friendly treat for each participant and include the recipe. Be sure to list all of the ingredients because many pups have allergies. Click here for dog food recipes. Snuggle up on the couch with your favorite holiday movie and make some Pupcorn for the whole family to enjoy. Any of you participate in a family game of holiday football?! Include your pup by forgoing the football for a frisbee. Dress you and your pup up in his or her favorite Christmas sweater and get together with some fellow mommas and their pups to toast the holiday season. Bundle up with your doggy and explore your neighborhood’s holiday decorations. It is a fun way to get some exercise and spend quality time with your pup. Growing up my Momma always hung personalized stockings with our names and filled them with goodies to open on Christmas morning. I have continued this tradition with my family, including Gatsby and now Daisy. Cook a special holiday dinner for the entire family to enjoy. Forgo your pup’s kibble for the night and surprise him or her with a home cooked nutritious meal. One of Gatsby’s favorite holiday meals is Holiday Pot Roast. I loved baking gingerbread cookies with my Grandmother as a kid, where the whole house would smell like the holidays. Now I bake Gingerbread Woofies for Gatsby. Plus ginger is super healthy for his immune system and tummy. Holiday photos are not just for your two-legged kids, many pet stores offer holiday photo days with Santa. Get outside with your pup and enjoy the season: have a snowball fight, make snow angels, go sledding…all of the things that the kid in you still loves. And if you are lucky enough to live in a more temperate climate: go to the beach, for a swim, or hike up the mountain to enjoy the view.